← 2nd Annual Mother of Pearl Tickets on Sale Now! Mobile Food Truck THIS Saturday! The Mobile Food Truck will be here THIS Saturday! Do not miss the opportunity to serve fresh produce to those in our community who are in need. 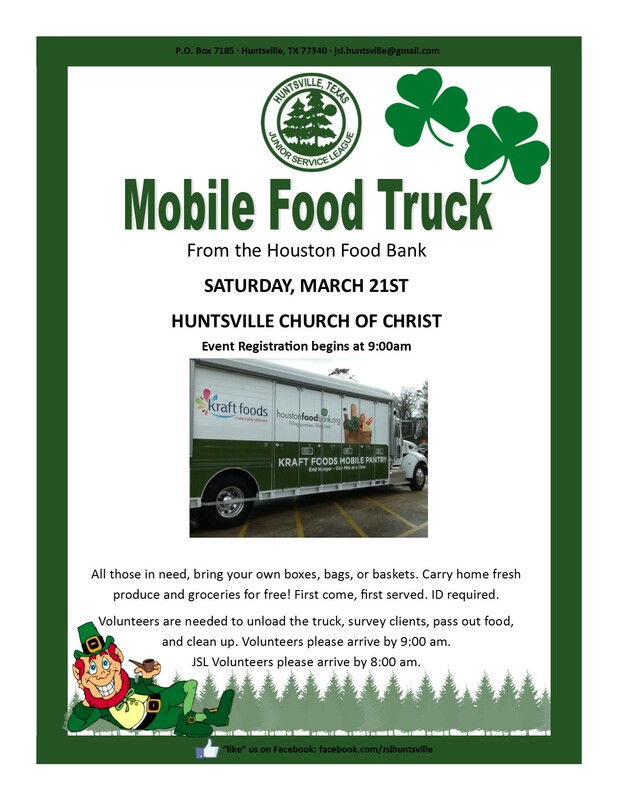 Come join Huntsville JSL and our partner, Huntsville Church of Christ, in banning together to serve those who need a helping hand. Volunteers are needed beginning at 9:00am. In addition to receiving free fresh fruits and vegetables, those in attendance can take advantage of free medical screenings should they wish. Huntsville Memorial and SHSU health organizations will be on hand to perform medical screenings for diabetes, cholesterol and blood pressure. Registration begins at 9:00am at Huntsville Church of Christ on March 21. The Houston Food Bank’s mobile food truck should arrive between 9:30-10:00am. The food distribution will begin as soon as the truck is unloaded. The forecast for Saturday predicts there will be rain, so bring your rain boots and rain coats. A plan is in place to limit the exposure to the elements, but it’s always best to be prepared!